Leaders in Arlington said the city is finally getting back to normal, as cleanup efforts continue in the wake of Thursday’s powerful storms. It was another busy morning Monday for power crews, as they worked to restore power to the last handful of residents still in the dark. As of Monday afternoon, fewer than 200 homes in Arlington were experiencing outages – and officials said not all of those were storm-related. Things are also getting back to normal at Arlington Baptist College, which suffered some of the heaviest damage in Thursday’s storms. 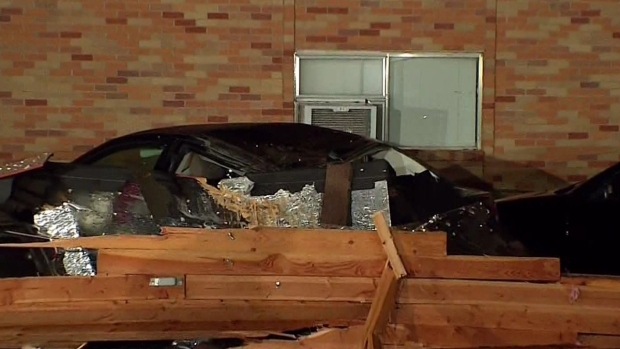 Powerful winds ripped a section of the roof off a women’s dorm building and threw it into a nearby parking lot, crushing several cars. By Monday afternoon, most of the mess was gone and blue tarps covered the damaged areas of the building. Over the weekend, students, staff members, local churches and community members helped clear debris and clean up the campus. Moody says they’re already working with contractors to repair the building and later this week, a structural engineer will examine it to determine if it’s structurally sound. If they’re given the all clear, students will be allowed to move back into a section of the building that wasn’t damaged. Classes have already been canceled through Tuesday while cleanup continues. Moody says if all goes well, they will resume classes Wednesday. Many of the students who lived in the damaged part of the building lost all their possessions during the storm. The college has set up a Go Fund Me page, where anyone can make donations to help replace some of those items.